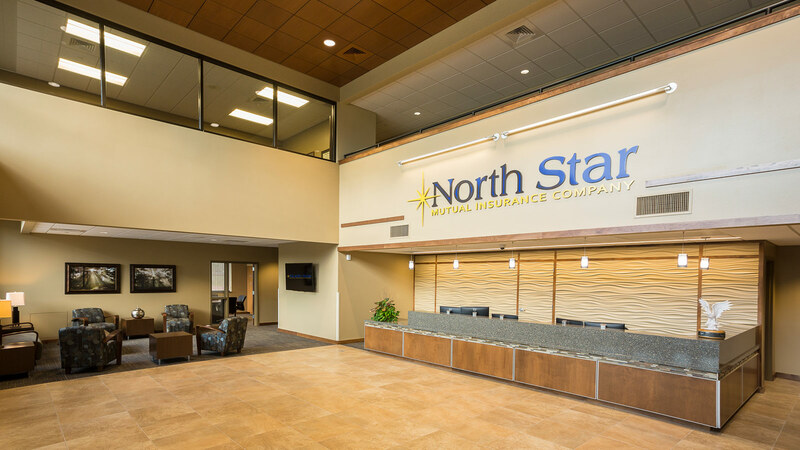 TSP has served as a trusted advisor to North Star Mutual Insurance Company since 1979. 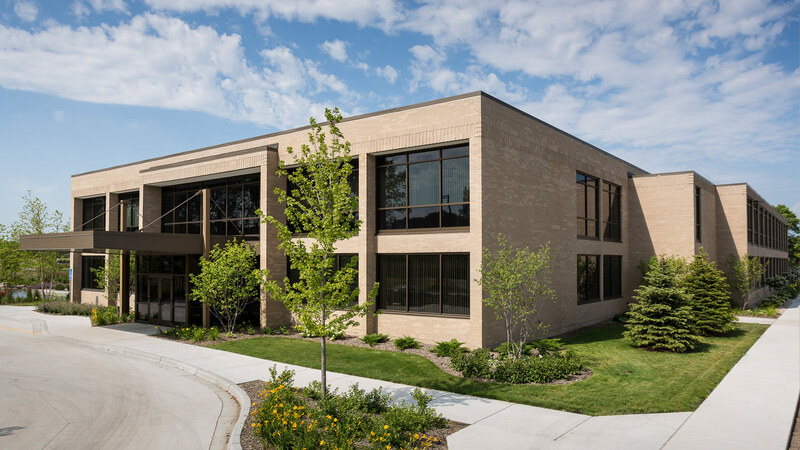 Continued steady growth prompted North Star to once again engage TSP for planning and design of a significant office addition at its corporate headquarters. 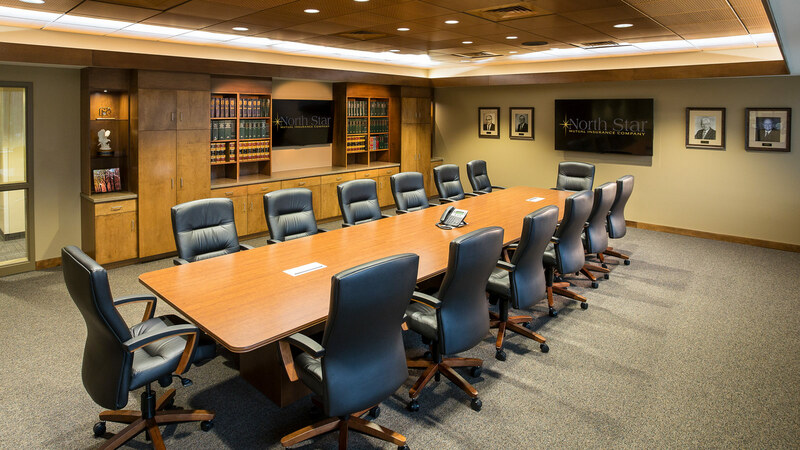 TSP’s architects and interior specialists collaborated closely with North Star’s executive team to keep the design highly contextual. 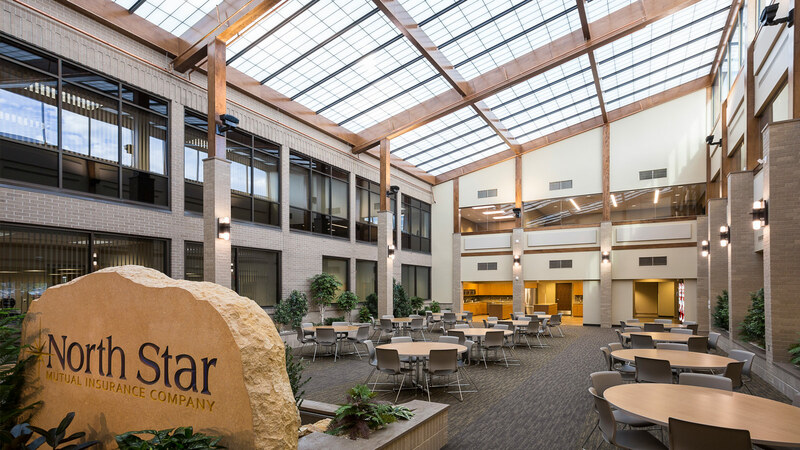 The original building and previous additions reflect North Star’s Midwestern roots and culture, and it was important for the addition to complement and elevate the existing facilities. Like TSP, North Star is a client-centered firm. The insurance company put its employees and policy holders first, requesting special design emphasis on the visitor entrance and interior environment for staff members, who typically stay on-campus for lunches, short breaks, and all-employee events. 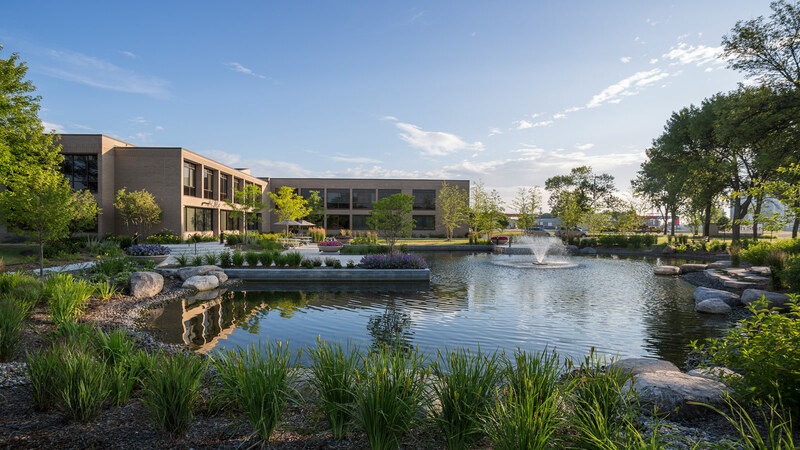 The signature look greets visitors and staff outdoors, with a redesigned pond and updated landscaping from our consultant partner Gene Ernst. The pond serves double-duty as a reservoir for the campus’ irrigation system. Meanwhile, a new walking path and gathering areas offer additional visual interest and functionality. The new public entrance leads to an inviting two-story lobby with distinct waiting areas. The executive suite and boardroom are nearby, but on the floor above to offer privacy for work sessions. Other collaborative meeting and conference spaces offer multiple ways for employees to connect. Even the right-sized open office areas include a select number of private offices to meet the needs of changing department sizes and work structures. TSP’s full-service approach included FF&E to complement the overall interior design and architectural flow of spaces. A two-story interior courtyard is flooded with natural light to tie together outdoor and indoor environments. It’s adjacent to an up-sized employee kitchen, vending, and support areas. Other features include expanded garage and mail room facilities, state-of-the-art mechanical and electrical systems, and larger parking lots for customers and employees.